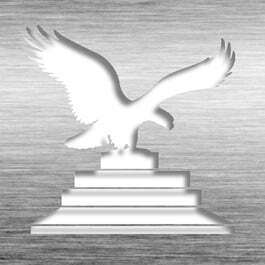 Perfect for corporate patent award programs and/or individual inventor awards. 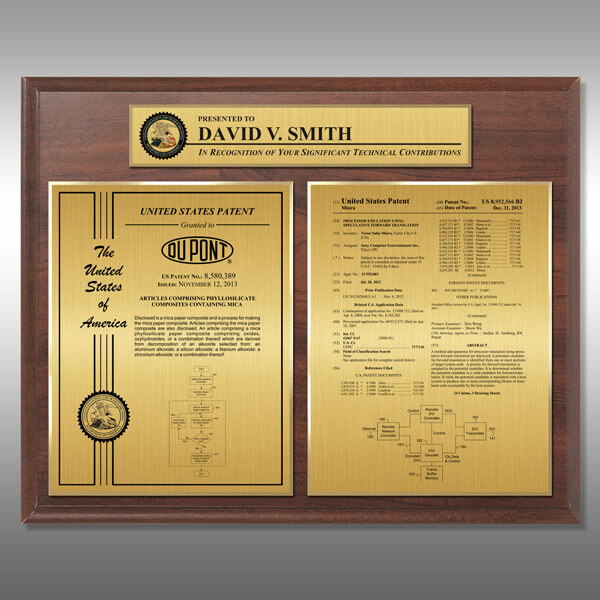 This large double patent plaque includes a presentation plate for an inventor name, company logo, or personal message. Available in Standard Front-Page Layout and Optional Custom Layouts (Click on photos to see available formats). Plaque is printed on a HD Plate, accented with metal trim and mounted on a affordable cherry wood board. Presentation plates are fully customizable to accommodate your award message or logo specifics. Main Plates: 8 1/2" x 11" - Presentation Plate: 12" x 2"
This Patent Plaque - Cherry Double Presentation CD-EG20P is part of our Presentation Series of products, check out other products & options available in the Presentation Series of our selection. This Patent Plaque - Cherry Double Presentation CD-EG20P can be modified to your requirements and is available for your corporate award programs.